Loves Rubberstamps Blog: Special Delivery!! Today is my design team day for The Cutting Cafe and this week we were given the Postage Stamp Shaped Card as our piece to design with. Now, this is a shaped card and Regina told us we had free reign on how to decorate it! Well, usually that is a great thing EXCEPT...that this whole week my Mojo has been on vacation and no matter what I tried, I just haven't been able to make anything worth a darn! 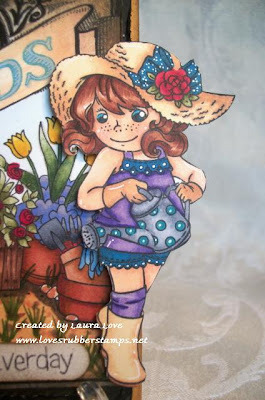 Soooo...I have been pouring over the internet, looking for inspiration and then last night when I still was no closer to figuring out what I wanted to do, I remembered a super gorgeous card that my coloring idol, Alyce from Kit and Clowder had done with the most gorgeous two-tone colored dress...AND... I remembered that she had made a coloring video on how she did it. So I decided to watch it and see if that helped spark some Mojo. Well, when you watch one of Alyce's videos, you are instantly hooked and I ended up watching all 16 of her videos...LOL! Yes, all 16! BUT... I have to say that it was TOTALLY WORTH every minute! I really learned a TON and besides now needing every copic color they make, I was sooo inspired to try some of her technics out! EEEEKKKK!!! I still can't believe that I colored this - LOL! 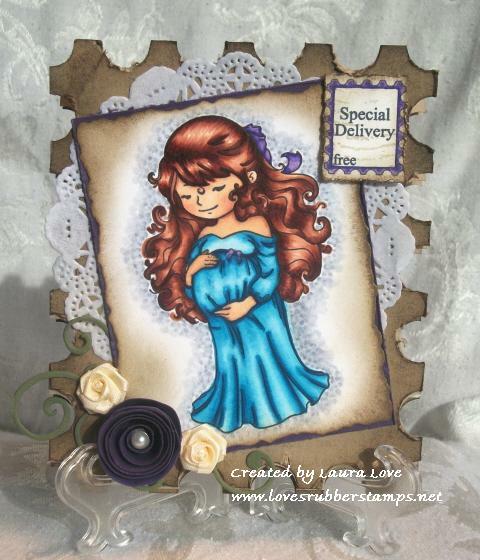 I can't stop looking at it :) This image is called Welcome Little One from Crafty Sentiments Designs. 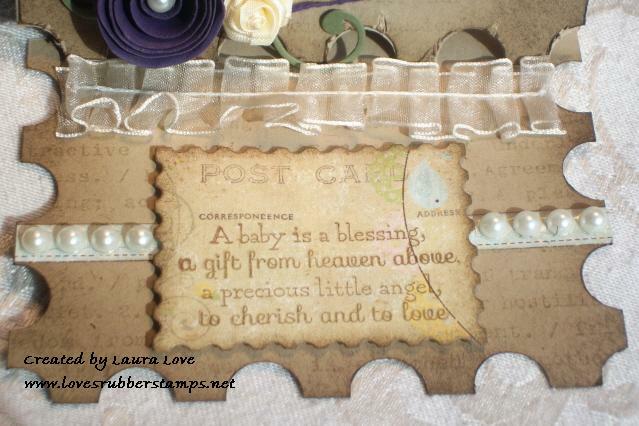 That cute little postage stamp saying is one that comes with the Postage Stamp Shaped Card template! I made my first rolled flower (purple one) and placed it on top of a Fancy Flourish Die-Namics. I actually layered the flourish behind my image panel because I didn't want to cover part of the image up. That cute little postcard was in my Simple Stories paper pack called Baby Steps. I cut it out using die from the My Favorite Things Dies-Namics Postage Stamp Stax, sponged it with Tim Holtz Walnut Stain distress ink, then stamped it with a sentiment from the Hello Baby stamp set from Flourishes. This card took me F-O-R-E-V-E-R because after I colored my image and was so impressed with myself that I was scared to mess it up - LOL! This image took me about 4 hours to color because I am as slow as molasses since I am learning! I could really tell a difference in how I was able to do the hair with copics and get the super fine feather strokes with them, then when I tried to do the clothing and had to use spectrums. Their nib is not very flexible and doesn't have as fine a tip so I couldn't get the super fine strokes like I could with copics. But, I have to make do with what I have and both types of markers just take practice. After watching Alyce's videos I think my coloring vastly improved already! It's amazing I think!! 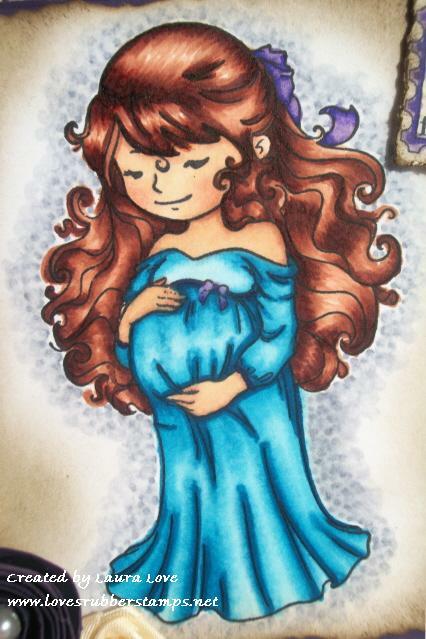 When you get a chance check out Alyce's videos, she is such a talented lady and a great teacher, they really are an amazing resource if you are just starting out coloring with copics like I am. But first... be sure to pop over to The Cutting Cafe and get yourself this super cute Postage Stamp Shaped Card! You will love it! Super sweet. Love the doily and flowers. Wow Laura!!! You knocked the coloring out of the park! Just awesome! 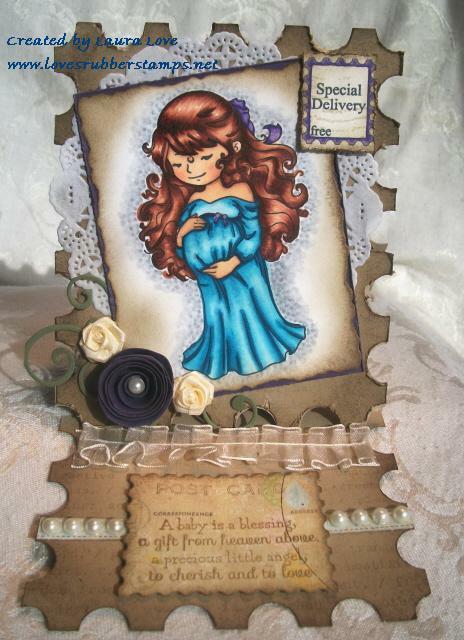 Gorgeous card, love the postal stamp shape and your colouring is awesome, thanks for joing us at Divas By Design this week. Wow, your coloring is fabulous, I love that you watched the videos and then got right to work, I did this myself for months and months and still have to go find some coloring mojo once in a while. So cute!!! Love this whole card and yes, you found your mojo! Wonderful coloring. You really are a master. So beautiful. There are so many details to look at. Great job. Simply stunning creation! I love the shape you used and your coloring is amazing! Keep up the hard work! Thank you for joining us this week at the Crafty Sentiments Designs Challenge! I hope you play along with us again soon! OMG Laura! Your coloring is so fantastic! I'm going to check out her vids to get some great techniques. Beautiful card! i love it!!! Fabulous colouring and wonderful design! Thanks for joing us at Penny's Paper Crafty and I hope we see you again soon!